Horse Chestnut (Aesculus hippocastanum): growing, planting, caring. A common tree, cultivated in streets and parks throughout the temperate world. Aesculus hippocastanum - the horse chestnut or conker tree - is a species in the soapberry and lychee family Sapindaceae. 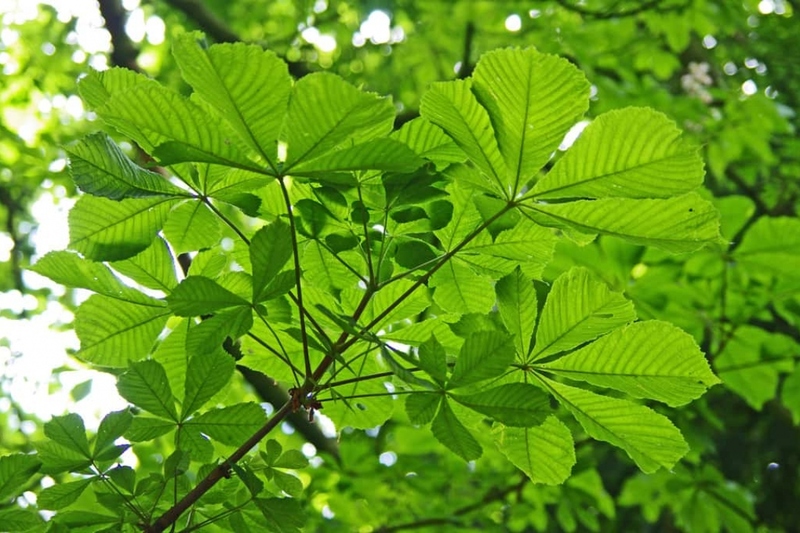 It is a large tree, growing to about 40 metres (128 ft) tall, with opposite and palmately compound leaves with 5–7 leaflets, each leaflet being 13–30 cm long making the whole leaf up to 60 cm across. The leaf scars left on twigs after the leaves have fallen have a distinctive horseshoe shape, complete with seven "nails »- hence the name. The flowers are usually white with a yellow to pink blotch at the base of the petals, blooming in spring in erect panicles 10–30 cm tall with about 20–50 flowers on each panicle. Fastoche is the tree that bears horse-chestnuts! It also has 5 to 7-lobed webbed leaves, and it flowers in white candles as early as April-May. Plant your horse chestnut in deep soil, fresh, well drained and rather rich. Plant preferably in winter, in bare roots or in mound. Dig a hole deep enough, twice as large as the root ball, without mixing the layers of the soil. Plant a solid stake at the bottom of the hole, on the edge, inclined to the prevailing winds. Cut the root hair - the fine roots that looks like hair - to balance the volume of roots and foliage. Plant without burying the boundary between trunk and roots of the tree, putting the soil layers in the same order you removed them. Tamp the soil around the roots with your foot, so you do not leave a pocket of air, and attach the stake to the trunk with a suitable extensible link. Form a hollow in the soil and water abundantly until you fill it. It can be useful during the first years to force the formation of a vertical main branch on your chestnut, keeping only one terminal branch. Afterward do not touch it except to remove entangled branches. To help your horse chestnut, it is better to limit the competition from grass at their base. Mulch it with dry leaves and shredded branches. Renew once or twice a year.